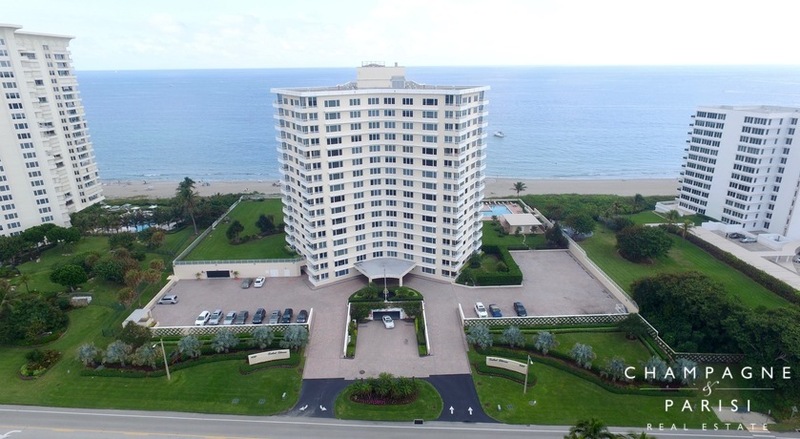 Sabal Shores, located at 600 S. Ocean Boulevard in Boca Raton, Florida is a beachfront condo complex offering stunning views of the Atlantic Ocean and Lake Boca Raton. The building is home to 125 units providing one to three bedrooms with 1,070 to 2,250 square feet of living space. Originally constructed in 1970, most of the units have been recently renovated and updated to offer modern and high-end features. Features commonly found in Sabal Shores Condo include wood and marble flooring, 10-foot ceilings, gourmet kitchens, luxurious master bathrooms, custom closets, and in-unit washers and dryers. Other features include hurricane impact glass windows offering stunning views from nearly every room and spacious outdoor balconies. Sabal Shores recently underwent major renovations which included concrete restoration of the entire building, installation of hurricane impact glass throughout, as well as a new roof, oceanside pool and sundeck, state-of-the-art fitness center, updated marble lobby, community room with new full-size kitchen, and updates to the hallways. Sabal Shores is located directly on the oceanfront, on A1A between Palmetto Park Road and Camino Real. This central location offers residents the convenience of being close to many of the nearby parks, as well as some of the area's premier dining, shopping, entertainment, and recreation options. If Sabal Shores sounds like the perfect oceanfront retreat, you may also want to visit some of the similar luxury condominium buildings in Boca Raton, including Sabal Ridge, Sabal Point, and Chalfonte. If you would like to learn more about Sabal Shores or any of the other Boca Raton luxury condominium communities, please call us at 561-998-9015. You may also reach us by completing the brief online contact form provided below and one of our luxury condo specialists will reach out to assist you. We at Champagne & Parisi Real Estate look forward to assisting you in finding your next dream condo in Boca Raton, FL!